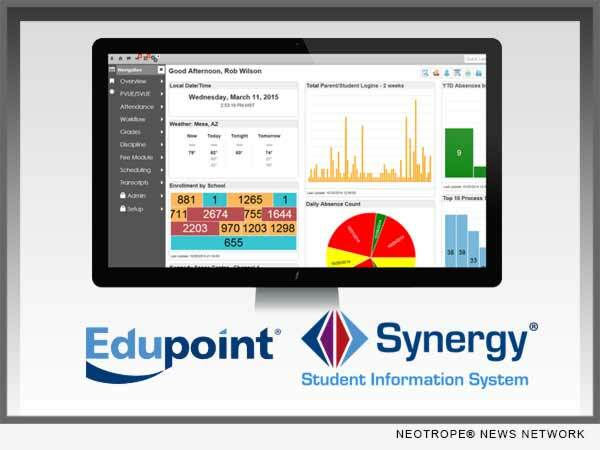 SAN DIEGO, Calif. /California Newswire/ — Edupoint(R) Educational Systems, creator of the industry-leading Synergy(R) Education Platform for K-12 student information and learning management, has been selected by Dehesa School District, Julian Union School District, and Calexico Unified School District to implement Synergy Online Registration through their partnership with the San Diego County Office of Education (SDCOE), augmenting the districts’ existing Synergy solutions. Ballington Academy for the Arts and Sciences, a charter school partnering with SDCOE, has also selected Synergy Online Registration. As a result, almost 15,000 students will join the more than 1.5 million students nationwide currently served by Synergy platform’s online registration module. Synergy Online Registration works seamlessly with other Synergy modules to streamline the school registration process for parents and district staff. The module’s intuitive web interface can serve parents in more than 20 languages, making it easy for them to enter their child’s information when and where they find it most convenient. This self-serve model eliminates not only the need for district staff to enter new student data, but also the cost and inconvenience of printing and distributing registration packets. Synergy Online Registration provides a high degree of flexibility to match district business practices, enabling districts to collect user-defined data, add or hide screens, add instructions to screens, and more. SDCOE manages the student information system for school districts and charter schools within San Diego and Imperial counties. These districts are successfully using Synergy with the support, training, hosting, and guidance provided by the SIS team at SDCOE.